Amélie is six years old. Raphael Poulain's only physical contact with the child occurs during her monthly medical checkup. Deeply moved by the exceptional closeness, the child cannot prevent her heart from beating a mile minute...Henceforth, her alarmed father is convinced that she suffers from a cardiac anomaly. Once a year, Amandine Fouet takes her daughter to Notre-Dame Cathedral where the child lights a candle so that heaven will grant her a little brother. One year, divine intervention occured 3 minutes later. Unfortunately, what falls from the sky is not a newborn but a Canadian tourist named Marguerite Bouchard who has decided to end it all over an affair of the heart. Amandine Fouet is killed on the spot. 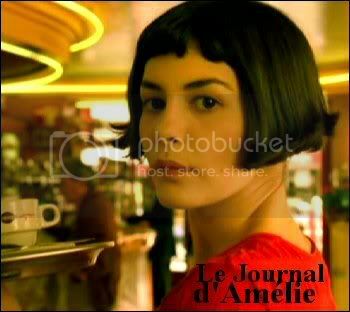 Amélie is a shy young woman with a pronounced taste for all life's small pleasures : immersing one's hand in a sack of grain, cracking the crust of a crème brulée with the back of a teaspoon or skipping stones on the Canal St-Martin. In the night of August 31st 1997, it suddenly hits her : she decides to straighten out other people's lives. But who's going to straighten out her life?